The 1970’s were a great time to be Groucho Marx. Unless you were Groucho Marx. Groucho died on August 18, 1977, at the age of 86. By all accounts he was unhappy in his personal life, although his career had undergone a celebratory resurgence. By some accounts, he may have been a bit senile. It was generally understood then as well as now that he was being pushed past the point of what was physically good for his health by his much younger companion, Erin Fleming. Groucho, thrice divorced, was 86. Fleming was 35. By the 1980’s, several lawsuits brought against her by the Marx estate were settled in the estate’s favor, including a payment of nearly a half million dollars to Arthur Marx, Groucho’s son. While Groucho’s health was on a downswing, leaving the comedian thin and gaunt, his voice nearly a whisper, his image and humor had become a cultural touchstone. Some of the biggest stars of the biggest sitcoms of the 1970’s were huge fans and it was not unusual for Groucho and Marx Brothers impressions to turn up on television. Groucho had become a cultural touchstone for a new generation who discovered him in late night movies. Welcome Back Kotter featured Gabe Kaplan’s Groucho impression in nearly every episode, and Robert Hegyes patterned his performance on Chico. 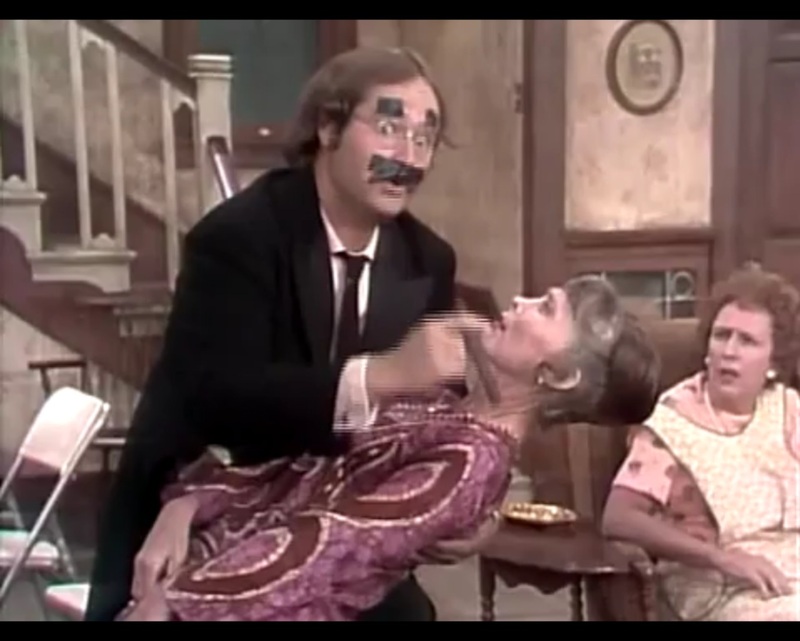 Here are the two of them portraying the Brothers on stage for Gabe Kaplan’s Groucho stage show. While Groucho seemed to be all over television, at least in the form of his persona, the real Groucho was set to make a guest appearance on Welcome Back Kotter. Kotter, it should be noted, also starred Marcia Strassman, who was part of the Yankee Doodle Doctor M*A*S*H hijinks a few years earlier. Now just a few months before his death, Groucho had to be helped onto the Kotter set, where the audience, expecting the grease paint mustache, duck walk, and rapid-fire zingers of his younger days did not recognize him and even the cast was shocked by his appearance. 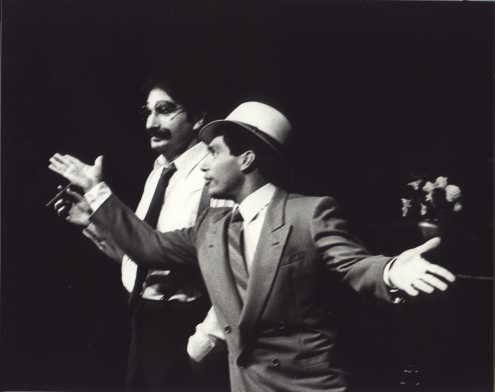 Robert Hegyes, especially, was affected, wondering aloud how he could go on with the show and do his usual Chico Marx impression after seeing Groucho that way. The cameo was nixed and only a few publicity photos were taken with the cast. However, Groucho’s appearance was so disturbing that the pictures have never been released. 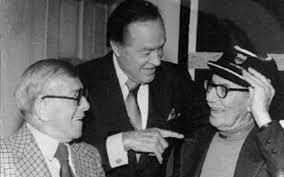 Groucho’s last appearance, one year previously at age 85, was a one and a half-minute sketch with George Burns (then 80 years old himself) on a 1976 Bob Hope television special. 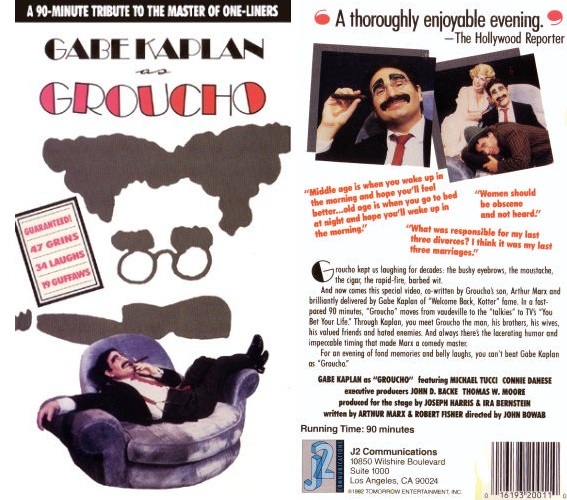 The program demonstrated with both perfect genius and utter sadness the two sides of Groucho in the 1970’s. On the one hand we see the real, frail Groucho, sitting on a chair and feeding straight lines to George Burns in a raspy whisper. On the other hand is Billy Barty, dressed as Groucho in his prime, wearing grease paint features, smoking a cigar, and chasing women. It seems that the producers felt that without Barty in the sketch as Groucho “as a young boy” no one would recognize the real Groucho Marx. Check the sketch out here, at about the 18:20 mark, until YouTube takes it down again. Groucho had lived long enough to be eclipsed by his own legend. A legend which, unlike Groucho, had not aged in 40 years. Legend has it that when Groucho died, he ascended to heaven. St. Peter met him at the gate and welcomed him to heaven. Groucho looked at him and said “I don’t care to belong to a club that accepts people like me as members” and promptly went down to the hot place. The end of Groucho’s life has always been a sore spot for me – I can only wonder what it must have been like for George Burns, who also had a revival in the ’70s, to go on for another 20 years. He was a workaholic so I’d guess he loved it, despite losing Gracie all years ago and close friend Jack Benny around this time. And unlike Marx, he was in very good health for most of those years. I met Groucho at his last public appearance. It was January 16 1977 at the Wilshire Hyatt House; I had just turned ten. I met Virginia O’Brien, and Susan Marx, and Kevin Marx Culhane…got my Arce book signed by Arce and Feneman and Pedro Gonzalez Gonzalez, and Groucho. A great day to be sure but in line with your post, it taught me something about mortality. Later that day we ate at the Brown Derby on Wilshire which, when I went back later as a teen, was gone. I have found that among academics, historians especially, there are usually formative moments of loss like these. In any event, the inclusion of Groucho, at any age, his or ours, is a blessing. Thank you so much. That was a great story and an amazing experience. You are so right about loss. So much of aging and maturing is about loss, but to look back at an event like you were at and realize how big a loss it was is really something. Thanks again for writing.